The list of malignant tumors that may affect the serosal cavities in the form of malignant effusions is essentially as long as the list of existing cancers, as almost any type of malignancy has been described at this anatomic site. There are, however, considerable variations in terms of incidence that must be taken into account. 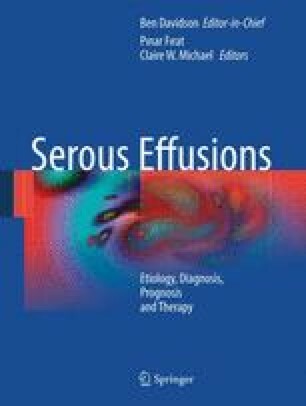 The previous chapters in this section focused on five of the more commonly diagnosed entities in effusion diagnosis – breast, lung, and ovarian carcinomas; malignant mesothelioma; and hematological cancers. The frequency with which one may diagnose any of the remaining cancers depends on the type of institution and diagnostic service one works in, as well as on geographic factors. Nevertheless, the most frequently encountered tumors among those discussed in this chapter are undoubtedly those originating from the gastrointestinal tract, followed by metastases from uterine (endometrial and cervical) carcinomas, with the remaining entities ranging from infrequent to exceedingly rare. It should be noted that papers cited in this chapter are limited to those in which unequivocal presence of tumor cells has been documented in the effusion based on cytological evaluation. Reports in which effusions have been described as “malignant” based on the fact that the patient had documented metastasis to the same anatomic compartment that has been diagnosed in biopsy material have not been included in this discussion.